Crayfish play important roles in aquatic and terrestrial ecosystems, both as food sources for many animals and as consumers of plant and animal material. 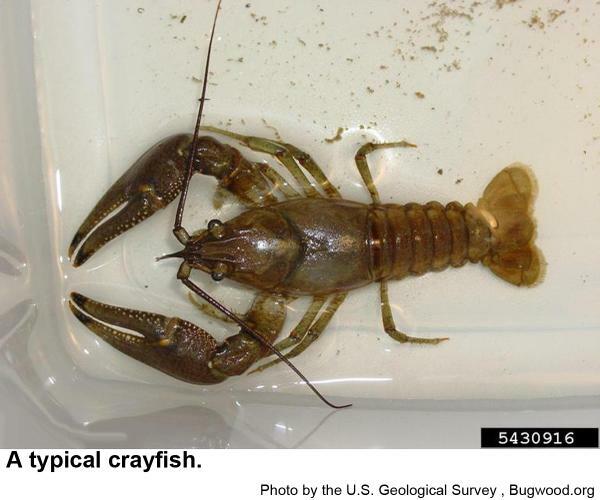 Crayfish are aquatic, but there are a few burrowing or "terrestrial" species. Areas of turf in low-lying areas that maintain damp soils and shallow subsurface water levels may support crayfish populations. Damage is not so significant to the turf, but large amounts of soil may be brought to the surface as the crayfish tunnel in the soils. 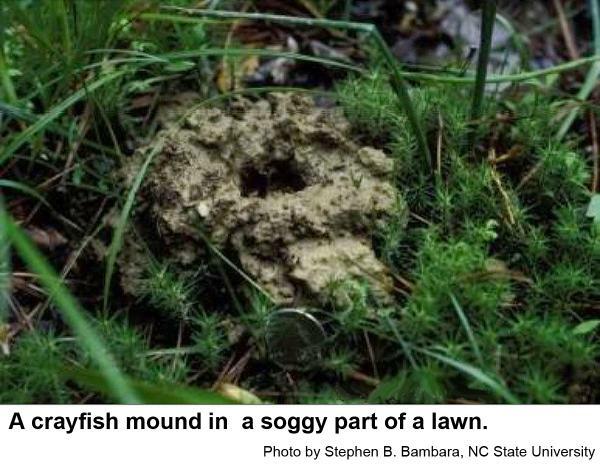 Such large mud turrets may create mounds that can be annoying or inconvenient, especially during lawn maintenance. Crayfish have 10 legs with the first legs modified into pinchers. Crayfish bring up a surprising amount of soil as they burrow into soggy soil. Control or reduction of their population is not encouraged. Habitats that support terrestrial crayfish most likely have a lot of soil water movement. Pesticides may migrate to many off-target organisms and are probably not a good idea on these soils. These nonprolific creatures should be appreciated like a interesting bird or turtle living on the property. Mound construction is somewhat seasonal. Annoying turret mounds can be raked smooth from time to time or dispersed with a water stream from a garden hose. Modification of the area using drainage techniques may reduce the moisture content and water level in the soil, thereby discouraging the population through habitat modification. This could be expensive, however, and population reduction is not necessarily a beneficial goal. These interesting creatures are unfortunately susceptible to many lawn pesticides. Control or reduction of their population is not encouraged. Habitats that support terrestrial crayfish most likely have a lot of soil water movement. Pesticides may migrate to many off-target organisms and are probably not a good idea on these soils. These nonprolific creatures should be appreciated like a interesting bird or turtle living on the property. Mound construction is somewhat seasonal. Annoying turret mounds can be raked smooth from time to time or dispersed with a water stream from a garden hose. Modification of the area using drainage techniques may reduce the moisture content and water level in the soil, thereby discouraging the population through habitat modification. This could be expensive, however, and population reduction is not necessarily a beneficial goal. Crayfish, Cambarus bartoni. Friday, S. and R. Nichols. No Date. North Carolina Wildlife Profiles, North Carolina Wildlife Resources Commission, Produced by the Division of Conservation Education. Crayfishes of North Carolina. Anonymous. No Date. Non-Molluscan Invertebrate Unit, North Carolina Museum of Natural Sciences.